Piano Tuner, a Norman Rockwell painting, appeared on the cover of The Saturday Evening Post published January 11, 1947. This is another favorite of Rockwell collectors, a classic enduring image of the world Rockwell painted. This painting was Rockwell's 244th overall out of 322 total paintings that were published on the cover of the Saturday Evening Post. Rockwell's career with the Post spanned 47 years, from his first cover illustration, Boy With Baby Carriage in 1916 to his last, Portrait of John F. Kennedy, in 1963. This was also the first cover for The Post in 1947. In 1947, there were seven Norman Rockwell Saturday Evening Post covers published. The original oil on canvas painting, 33 x 31 inches or 84 x 78.5 cm, is part of a private collection. on page 173 of Norman Rockwell, A Definitive Catalogue by Laurie Norton Moffatt. One study also appears in the Norman Rockwell Catalogue on page 173. In this painting, Norman Rockwell shows us a piano tuner employing his craft, and, in this particular instance, enjoying a audience. 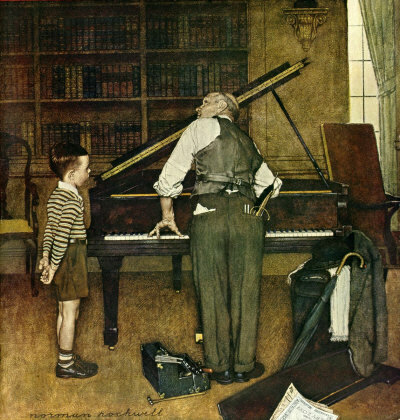 Rockwell felt that he would get a lot of letters with criticism about the unusual way that the piano tuner was hitting his octave in the painting. Rockwell always strove for extreme accuracy in even the most minute details in his paintings. He even hired a professional tuner to consult as a technical supervisor for the model's pose in this painting. He was that concerned about detail. The consultant piano tuner said that professional tuners hit an extreme amount of octaves during the course of one day's work. He explained that many of his colleagues simply learned to play octaves using the thumb and the third finger since the little finger was not strong enough towithstand the repeated stress. Piano Tuner was only one of 322 Norman Rockwell Saturday Evening Post covers; Here is the list of Norman Rockwell Saturday Evening Post cover illustrations. Rockwell's attention to detail also shows through with his including of all the tools and gadgets that the tuner would carry with him to a job. The little boy is probably the beneficiary of all this work. His piano lessons can start soon aftter the tuner completes his task. Do You Have A Great Story, Opinion Or Contribution About Piano Tuner?